"I like talking to you. I want to know all about you." "Destined to be a holiday classic." That's the big fancy pull quote on the back of the case housing this DVD, but it's unattributed, which suggests that it's not from a review of the movie, but demonstrates some wishful thinking on somebody's part. One Special Night is unlikely to take its allegedly rightful place alongside It's A Wonderful Life anytime soon, as what's here is a pretty maudlin, derivative bit of work. It's supposed to be a holiday movie for the senior set, I guess, or a Christmas story for those who find things like Rudolph the Red-Nosed Reindeer just too darn edgy. James Garner plays Robert, a contractor, whose wife, Mary Beth, now resides in a hospice; she's fragile from a series of heart attacks, and recognizes her family less and less due to the ravages of Alzheimer's. Robert takes comfort with his two daughters, one of whom is in from New York for Thanksgiving, the other of whom has a child and another on the way, though she's now separated from her workaholic husband. 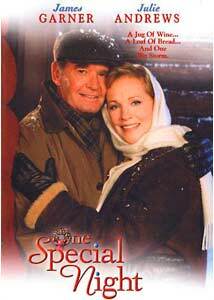 Julie Andrews is Katherine, a pediatric cardiologist whose husband died a year ago, after spending his last days in the same hospice as Mary Beth; though Robert and Katherine have been neighbors for years, they've never met, but a brutal holiday snowstorm sets that right. She offers him a ride home in her stylish but impractical Jaguar, which, shockingly, dies en route, and they're left to fight off the elements. Sanctuary comes in the form of a cabin, just yards away, where these two strangers hole up for their (can you guess?) one special night. They scavenge for Thanksgiving dinner—macaroni and cheese, and a bottle of good red wine—and they trade platitudes about life, love and family, in a manner that is intended to but is unlikely to succeed in warming your heart. Garner is especially good—he's such a great soldier that he can take the mundane and give it some interest. And that's an especially useful skill to have with the script these actors have been given. I don't know whether or not this was originally produced for the Hallmark Hall of Fame series, but a lot of the dialogue sounds as if it was lifted right from greeting cards: "You're smart and tough, without being afraid to be feminine." "I choose to be a grownup." "I'm here because they're Mom and Dad, and I'm not finished needing them." On the rare occasions when I've met actual human beings who speak like this, I run away as fast as I possibly can. Almost as bad is the manner in which the movie beats to death its few jokes. What's passably funny once is less so the third time, and still less the seventh, or ninth, or twentieth. You can feel the two lead actors pressing—they're pros, but they must know that they're in a bit of claptrap here. And the general sloppiness extends even to the closing credits, which are riddled with typographical errors—the leading lady's cosmetologist is billed under "Ms. Andrew's Makeup." Oops. Image Transfer Review: The picture quality is workmanlike and not especially artful. This was clearly a backlot job, and it seems as if lots of pink filters were used, to flatter the actors, and to obscure the fact that what we're looking at isn't snow, but a whole lot of Idaho flakes. Transfer to DVD is satisfactory, with decent color balance and blacks. Audio Transfer Review: That's not wind and rain you're hearing; it's nasty crackle from the sloppy audio transfer. Dialogue is generally comprehensible, but there's too much interference on this limited track. Extras Review: The promotional copy with which dOc was provided promises that the proper release will have chapter stops, interviews, cast biographies and optional Spanish subtitles, but the disc under review here has only a trailer, and no chaptering. It's easy to tee off on a movie with a title like this, but there's nothing very special about One Special Night. There is no shortage of holiday pictures superior to this one, and if it's Garner and Andrews you want, you're much better off with either Victor/Victoria or The Americanization of Emily.